The high-end, 135-room hotel would be built at Center and Commercial streets, about a block from the new Marriott and proposed lodging at the former Rufus Deering Lumber site. 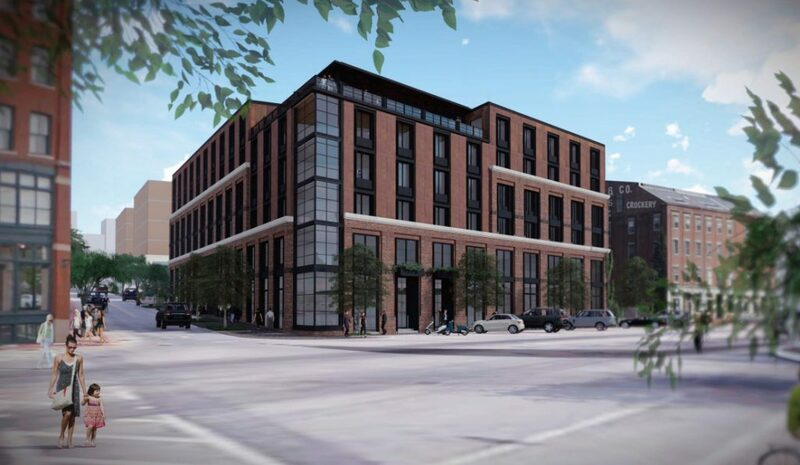 A rendering depicts the six-story, 135-room boutique hotel proposed for the Portland waterfront at the corner of Center and Commercial streets. 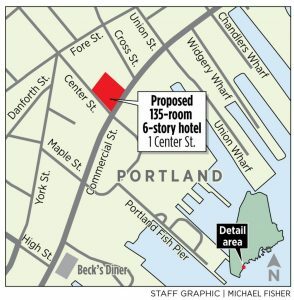 Courtesy of Fathom Cos.
Another high-end hotel has been proposed on the Portland waterfront, the ninth to be built or planned for Commercial or Fore street in the past 15 years. Developer Jim Brady wants to build the Center Street Boutique Hotel on a half-acre portion of what’s now a surface parking lot on Commercial Street. The 135-room hotel would be designed to match the buildings in the designated historic district, including the Sawsey and Co. building next door, Brady said in an interview Wednesday. Renderings of the hotel filed with the city show a six-story, red-brick building with tall windows and a rooftop patio on the corner of Commercial and Center streets. So far, only renderings and floor maps of the proposed hotel have been submitted to the Portland Historic Preservation Board. Brady, through Fathom Cos., the development and hospitality management firm of which he is president, has not filed a site plan or a development proposal. The board will hold a workshop on the proposal Dec. 5. Board members have oversight of the building design because it is new construction in the Portland waterfront historic district, said Deb Andrews, historic preservation program manager. The city’s historic preservation ordinance does encourage developers to take the dominant features of the district into account during building design, Andrews said. In the case of Commercial Street, that means blending in with a nearly unbroken facade of red-brick buildings. So far, it seems like the Center Street hotel design is “moving in a good direction,” Andrews said. Portland has witnessed a hotel building boom in recent years. Developers have added 730 hotel rooms since 2012 and are expected to add 400 more by 2020, a far higher rate than the national average, according to one city estimate. The Center Street proposal is about a block away from a Courtyard Marriott and proposed hotel at the former Rufus Deering Lumber Co. site on Commercial Street. Despite rapid growth in hotels, the market continues to be profitable. Revenue per available room in Portland rose from $64.43 in 2012 to $88.63 in 2017, according to data from STR, a Tennessee-based hospitality research firm. Brady, who opened the high-end Press Hotel in the former Portland Press Herald building on Congress Street in 2015, said despite competition, he still thinks Portland is a rich lodging market.